The indifferent attitude towards ETFs, which look like mutual funds but trade like shares on stock exchanges, prevails across the country. No wonder, then, that ETFs have yet to take off in India 13 years after the launch of the first such investment product. Mukesh Chothani, a mutual fund distributor at Nashik in Maharashtra, says he rarely recommends equity-oriented exchangetraded funds (ETFs) to clients. The reason is simple - he doesn't benefit much from recommending ETFs whereas he gets a commission in mutual funds (MFs). "ETFs account for only one per cent of my clients' assets under management," he says. The lack of interest in equity-oriented ETFs is not limited to Chothani. The indifferent attitude towards ETFs, which look like mutual funds but trade like shares on stock exchanges, prevails across the country. No wonder, then, that ETFs have yet to take off in India 13 years after the launch of the first such investment product. The numbers speak for themselves. Until March, assets invested in ETFs amounted to Rs 964 crore (about $160 million), or half a per cent of the total equity assets in the MF industry in the country, according to data from Value Research. Equity ETF assets jumped in April to Rs 4,359 crore (about $726 million), or 2.45 per cent of MF industry assets, when the government sold stakes in 10 state-run companies through the Goldman Sachs Central Public Sector Enterprises ETF to garner about Rs 3,395 crore. Still, this is a fraction of the $2.3 trillion of ETF assets globally at the end of October 2013, according to consulting firm Ernst & Young. So, why haven't equity ETFs gained popularity in India? India got its first equity ETF in 2001 when Benchmark Mutual Fund - acquired by Goldman Sachs in 2011 - launched the Nifty ETS Fund. (ETS is short for exchangetraded scheme). There are now 26 equity ETFs in the country, but awareness is still limited. "Indian savers love fixed deposits and real estate. They don't yet understand how ETFs can be leveraged in the portfolio," says Rohit Shah, a Mumbai-based investment advisor. He says ETFs are much more popular internationally because of their lower cost. But in India, the cost structure of ETFs is similar to MFs after taking into account the securities transaction tax, brokerage, demat charges and expenses of fund houses, he adds. ETFs have also lagged behind traditional MFs in terms of performance. MFs that invest in a broad range of shares have posted higher returns than ETFs across different time periods and at a lower risk. (See: The Performance Differential). 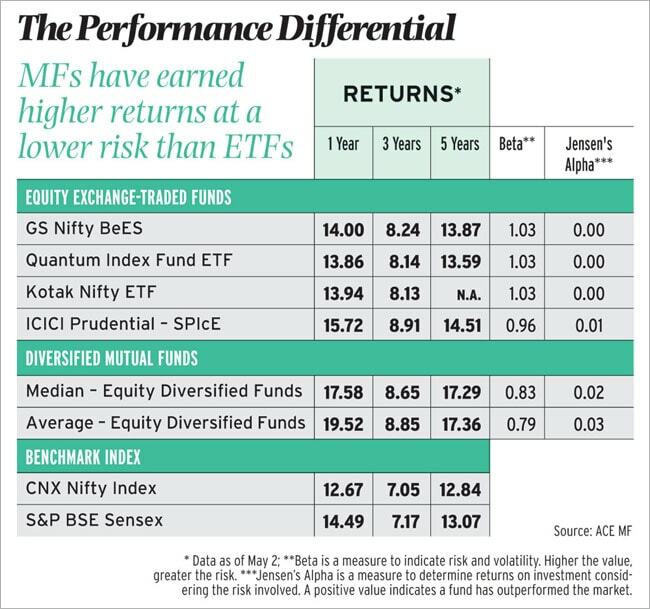 Analysts say the reason why MFs have outperformed ETFs is the investment strategy behind the two sets of products. Most MFs are actively managed by fund managers, who use analytical tools and their own judgement to decide which stocks to buy and sell. On the other hand, most ETFs are passively managed as they typically invest in the same securities that comprise an index they track, such as the Sensex. Equity ETFs have not got much attention also because equities have seen limited participation from investors in the past few years, says Vishal Dhawan, Chief Financial Planner at Mumbai investment advisory firm Plan Ahead Wealth Advisors. Another reason for the poor response to ETFs is the lack of interest from institutions such as pension funds and insurers. "ETFs are not on the approved list of many institutional investors," says Vineet Arora, Head of Product Distribution, ICICI Securities. "Even the IRDA [Insurance Regulatory and Development Authority] has only recently allowed insurers to invest in ETFs." Should investors in India consider ETFs? Opinion is divided on the issue. "I would personally prefer to invest in an active fund driven by a philosophy I understand and agree to," says Aashish Somaiyaa, CEO and Managing Director of Motilal Oswal Mutual Fund. Somaiyaa adds that demand for ETFs from retail investors will likely rise in coming years after the Securities and Exchange Board of India, the capital-markets regulator, last year framed regulations that seek to increase transparency in the working of financial advisors and shift their business model to a fee-based structure from commission-based. P.V.K. Mohan, Head of Equities at Principal PNB Asset Management Company, suggests investing in actively managed funds over the next five to six years as he feels they can potentially offer higher returns in a growing economy like India's. However, some other market participants feel that the ETF segment has potential to grow given that it is now open to institutional investors. ETFs may also be a better option for first-time investors as they are cheaper, mirror an index and save the hassle of choosing a fund from hundreds of actively managed mutual funds. Shah, the Mumbai-based investment advisor, says he normally recommends exposure of 10 to 15 per cent to ETFs. "This depends on one's investment objectives, duration and the asset allocation," he adds.